i’m not a big fan of new year’s resolutions (mostly because i can never keep them), but i am a big fan of setting small short-term goals each month and working towards them. so this year i’m “resolving” to make more of my short term goals plant-related. i’ve started to notice that even the teeniest bits of green in my life make me exponentially happier. so when is saw these miniature terrariums from tortoise loves donkey at etsy (around $5 each) i was inspired to indulge in my new found love for baby plants (i got 6 mini baby’s tears plants at terrain last month!) and terrariums at the same time. i’ve been scouring my kitchen this morning looking for tiny vessels (vanilla extract bottles? vintage glass pill bottles?) to fill with mini plants like these. they would be the perfect thing to surprise friends with- small enough to carry around, but cute enough to count as a “just because” gift. click here to pick up one of these from etsy, or click here to learn how to build your own terrarium from tassy of sprout home (just scale down the amounts to fit your tiny vessel). Those are so lovely! It really is nice to surround yourself with green, especially in the cold dead winter! a perfect use for my vintage labware! i love the dirt-less varieties! these are so cool – i can see a bunch lined up on a kitchen window sill. and they seem easy enough for someone like me who doesn’t have a green thumb! great idea — even the tiniest pinch of green tends to brighten people’s spirits. and these little containers would keep my cat from treating them like a salad bar! Very Cute! I just love miniature things! Adorable — they’re the perfect desk accessory too! I second the “more green” new year resolution. The terrariums look lovely. This is a wonderful resolution:) I came across your blog yesterday and I just love it! You have so many amazing ideas! Thank you for this post!! Seriously, thank you! My goal for the year is to bring plant life into my home, but I have zero idea as to what I’m doing…that Etsy seller might be getting quite a bit of business from me! Its so cool, thankyou for showing us your things. yup! perfection! totally in love with these! Funny, I have gotten really into plants lately too (especially since we can’t have any pets.) After you over-water your first couple then you start to get the hang of it. I recommend blubs as well to any beginners, we got one around thanksgiving and thought it wasn’t going to grow until all of a sudden it’s shot up 12 inches in 3 weeks! they can grow in cool containers as well. these are adorable – esp the little air plants – but have no drainage and may not be suitable for plants that grow in dirt – the roots can rot. which would be sad for someone who’s trying to work on their green thumb! i’m not a huge fan of new year’s resolutions either, and i realized this week that i’m no good at keeping them either. Those look like the bottles contact lenses sometimes come in. I’ve been collecting them whenever I get a new set and have been at a loss as to what to do with them. oh my good lord. i’m a science geek and i love this!!! I love this idea! I am notorious for killing plants, but this might be the perfect way to add some green to my home. thank you for making me so happy…ordering some now! I’m a fan of the mini plants. Any suggestions on where one could get vintage glass pill bottles? @ Thyrza- I was totally wondering this myself. I love terrariums but the ones I have made have not worked out so well. I think I chose the wrong plants and the wrong soil. But it’s a good point to make that succulents shouldn’t be in soil and airplants need air circulation… But these minis are nevertheless super dooper cute and very inspiring! 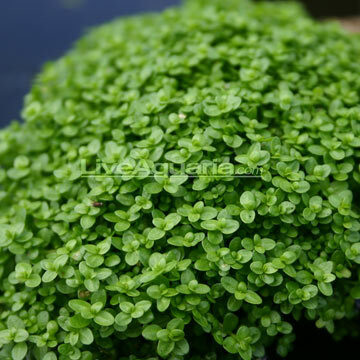 as soon as i saw these, i knew i had to make some myself..
mini baby’s tears plants – is this plant Soleirolia?